Car cigarette lighter adapter (12 V) or Full-automatic 110 V / 220 V wall charger. Strong, flexible and UV resistant. Only 2.1 kg (4.62 lbs). Length: 255 mm Width: 155 mm Height: 170 mm Those values are almost the half of the old technology dinosaur´s competitors. What is Innovation for you ? Works over strong Sun Light. Suitable for readings under continous wetting - rain simulator. The new MiniReflecto is smart, light and robust. It is time to forget the old dinosaur’s technology. Android smartphone bluetooth interface (optional). The new MINI can make around 8000 sequential measurements per battery charge. The MINI uses standard AA size batteries that are easy to find in market and easy to replace at any time. 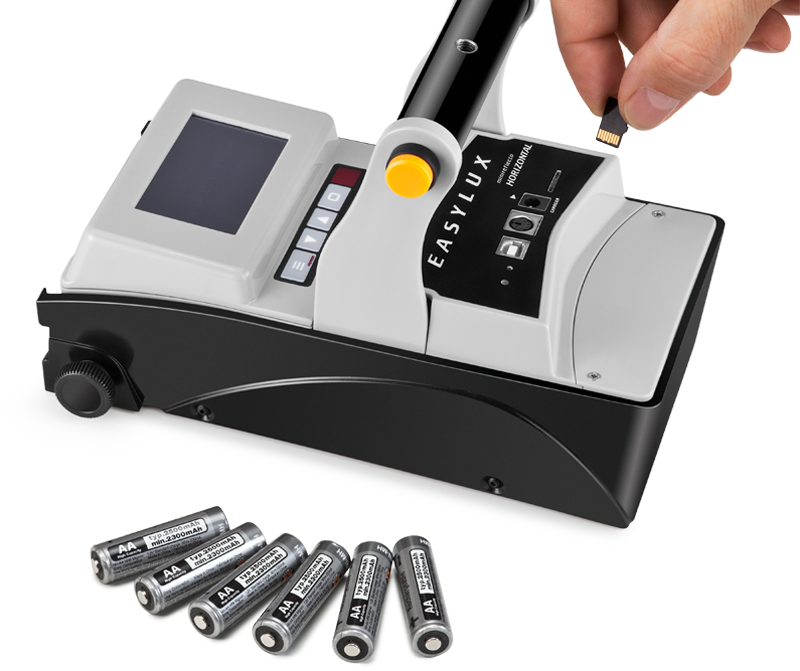 Light and small handheld instrument with only 2.1 kg and very compact dimensions. Exclusive Airplane carry-on luggage compatible carrying case – dimensions sum less than 100 cm. Ergonomic operation and wireless remote control. Works with profiled marker up to 15 mm. The new MiniReflecto Horizontal measures the night visibility (RL), the Day Visibility (Qd), the visibility under wet (RL wet) and continuous wetting conditions (RL-2 rain) of road markings. With repeatability of 2% and reproducibility of 5% the new MINI can make around 8000 sequential measurements per battery charge. The MINI uses standard AA size batteries – easy to find in market and easy to replace at any time. The MINI weight is less than 2.1 kg – with AA battery – and the size is very compact (255 mm x 160 mm x 220 mm). Those values are almost the half of the old technology competitors. 30-meter by ASTM E1710 and EN1436 for RL (88.76° / 1.05°). ASTM E2302 and EN1436 for Qd (2.29° ). ASTM E2177 and EN1436 for RLwet. ASTM E2832 and EN1436 for Continuous Wetting RL-2 . The MiniReflecto uses LED technology, which makes the instrument almost maintenance-free and energy efficient. The innovative patent pending optical system is according CIE V( ʎ ) specifications, enabling accurate measuring of all colors and types of road markings – even profiled up to 15 mm. Color transflective (sun readable) LCD with touchscreen. Indicates the gradient (tilt) of the floor plane. Battery charger compatible with car cigarette lighter adapter (12 V). User removable SDCard (4 GB). The instrument can store more than 900.000 measurements. 1 – Use standard AA-size batteries. Workers who undertake air travel take benefit from the use of ordinary double-A batteries. They are easy to find and easy to replace at any time. The new MINI can make around 8000 sequential measurements per battery charge. 2 – Speed up loading and unloading process. 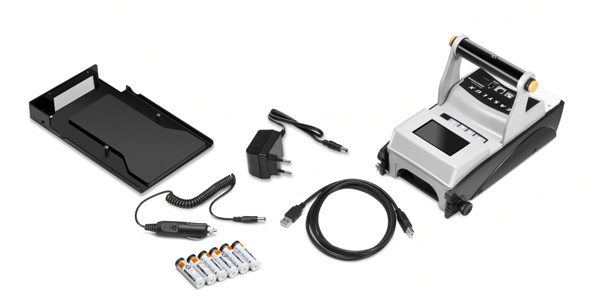 Small, portable devices require less valuable space in the marking truck and speeds up the processes of loading and unloading it for measurement. It is easier to move from one site to another. On air travel, it can be transported as carry-on luggage, avoiding extra charges. 3 – Eliminate the operator’s fatigue by muscular effort. If you still carry a 10-kg device to work with, you are far behind! 4 – Use with smartphones. 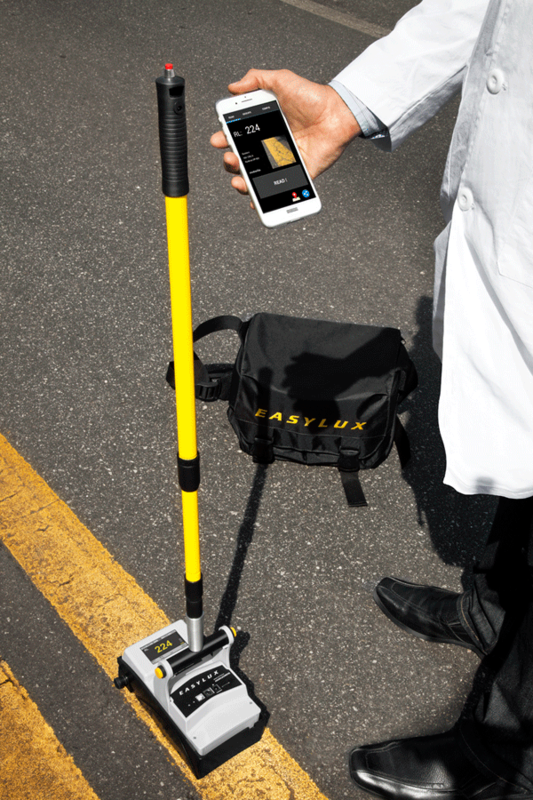 The EASYLUX app let’s you take photos, add notes, and export measurement results to third-party apps such as WhatsApp and Google Maps, or you can send all measured results by email. The photos are combined with the measurement results, so that a single photographic record allows the complete analysis of the signage, becoming a powerful documentation tool. 5 – Avoid airplane extra fees and battery warnings. 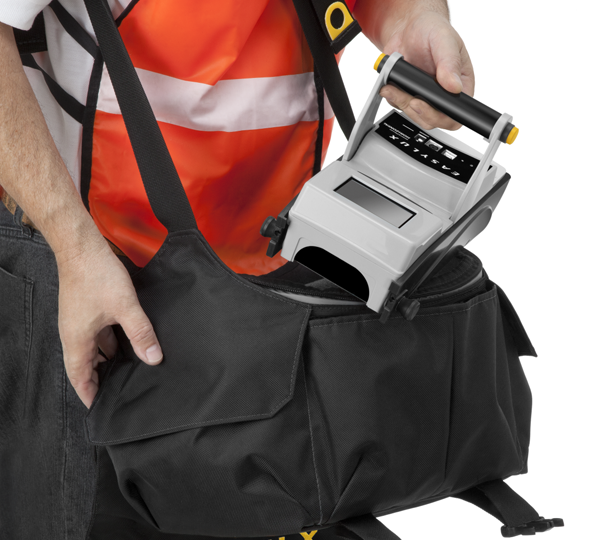 The conquest of the portability: you can move your light and small road marking retroreflectometer in a backpack. For measurements in urban roads, technicians can now move by bicycle, subway, or train carrying a road marking retroreflectometer in a backpack, a practice unthinkable less than 4 years ago. 6 – Approved by independent test laboratory. 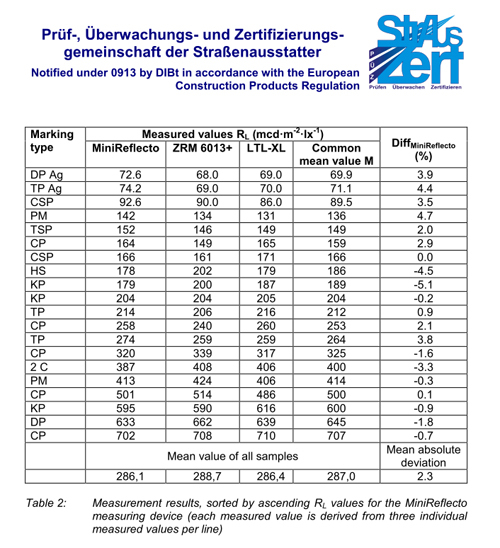 The MINI is certified to EN1436 and ASTM E1710 by StrAusZert Germany. 7 – Rain conditions compatible. 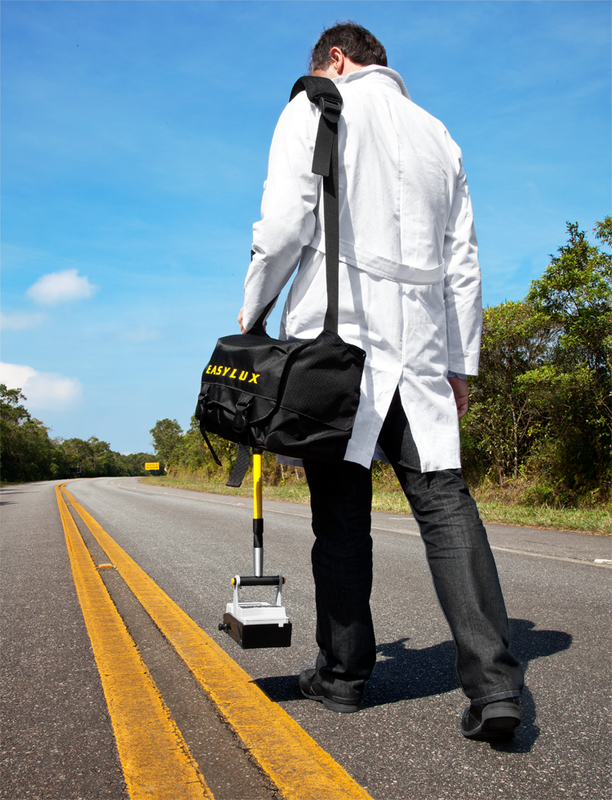 The MINI for road marking is an external beam instrument. It is completely immune to solar light or any kind of external light. It is highly valued by professionals who aim for demonstrate the behavior of materials under rain conditions or those who often make trips. The MINI measures the night visibility RL, the visibility under wet RLwet and continuous wetting conditions RL-2 rain of all shapes and colors of road markings, even RL profiled up to 15 mm without adjustments. The patented foldable and removable Qd light source makes the user work simple and practical. 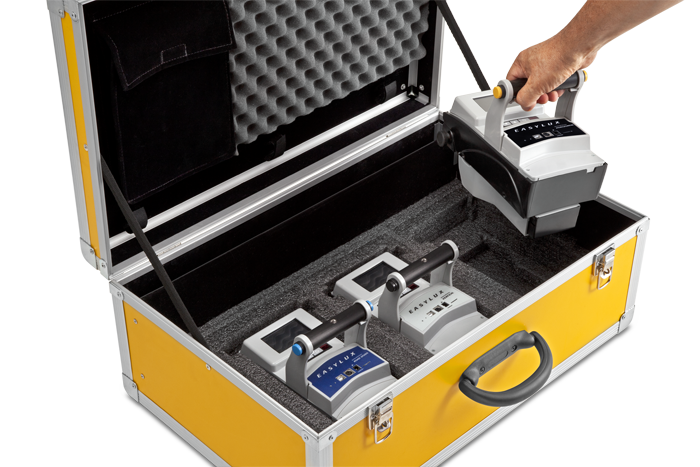 The Qd light source can be removed if Day Visibility (Qd) measurements are not required. 12 – Free software tools. There is no doubt that, when choosing a retroreflectometer, one must take into account the ease of handling and managing data. 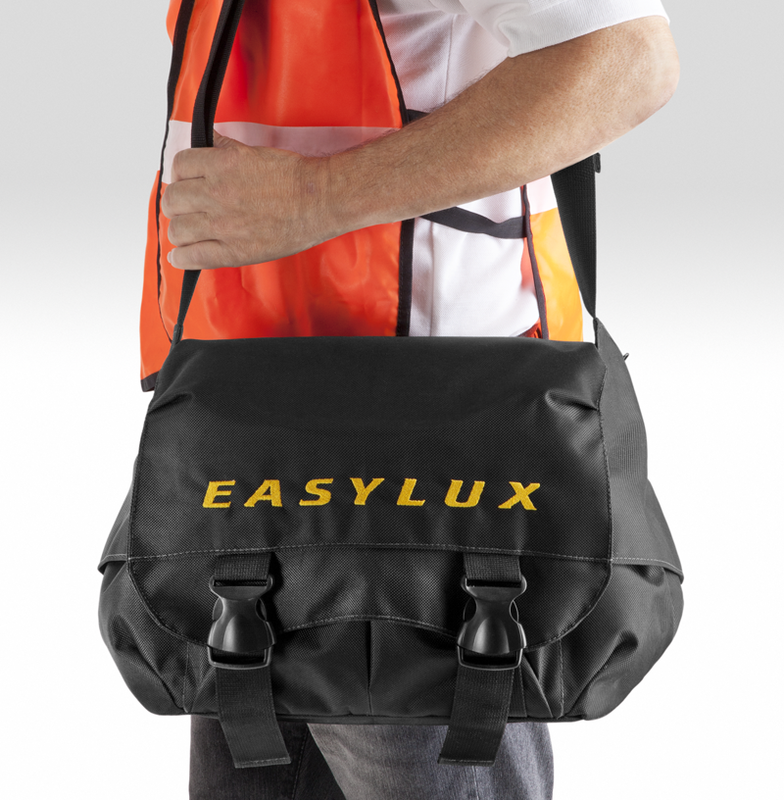 If a more detailed analysis is required, you can import data with Easydata, a free software compatible with all EASYLUX models. 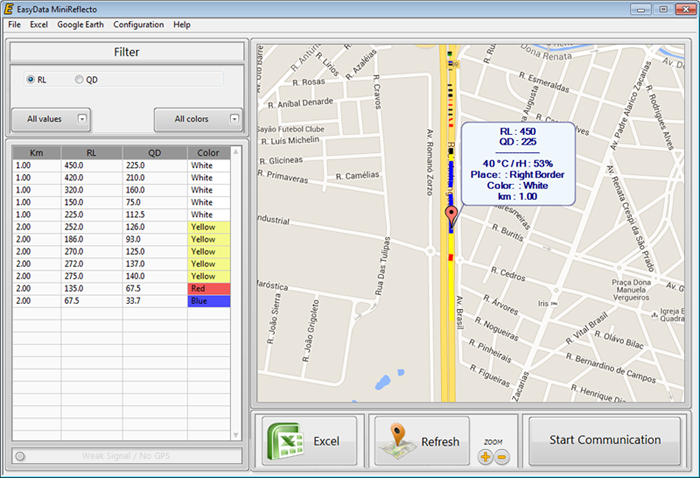 You can bring all retroreflectometers – road marking, road studs, road signs – into a single light box.